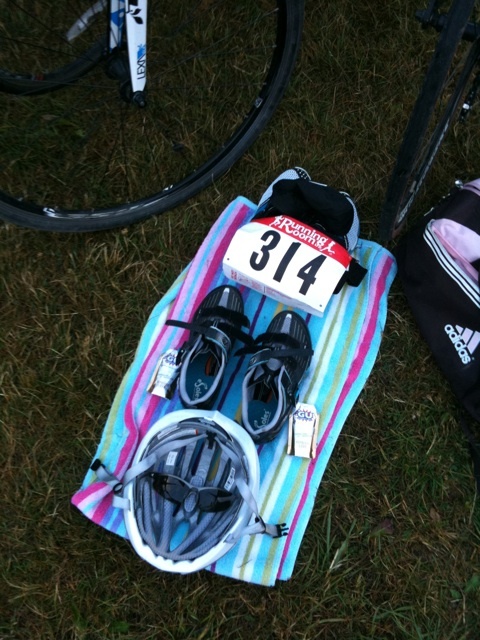 I arrived early at Elk Lake on race day to beat the crowds, found my transition number and racked my bike. After picking up my timing chip and getting my arms and legs drawn on with a sharpie (getting marked with my race number), I set up my transition area the way my coach Noa had instructed me to do so: cycling gear in front, running gear in the back. She also had me make a list of everything I needed to bring for the race, under sub-headings of swim, bike and run. Unlike a running race, when you generally only need to remember to bring a handful of things, I had a list of about 15 things I needed to bring for the triathlon: bike, helmet, sunglasses, water bottle, gels, tri shoes, cycling shoes, towel, wetsuit, goggles, swim cap, race belt, race bib, tri suit, Garmin… needless to say, I’m glad I had the list! I was happy to hear that morning that wetsuits would be allowed, as the temperature was just borderline where they would disallow it the previous day (if the water temperature taken on race day is above 22 degrees, wetsuits are not allowed). After suiting up, I joined the last wave of swimmers in the water. 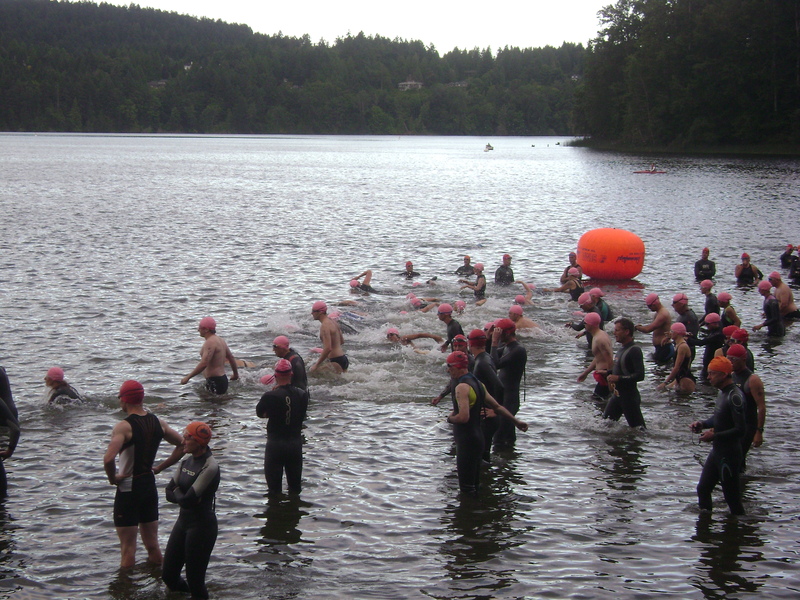 I wasn’t feeling nervous about the swim, thanks to doing the Thetis Lake MS Swim the previous week. I wasn’t feeling nervous at all, actually. I was more looking forward to see if a triathlon was just as fun as it looked. After the gun went off and I fought my way through the crowd of swimmers, I was swimming at a fairly consistent pace, except I found myself meandering more often than not. Without anything below or to my side to use as a guide, I found myself swimming of course quite a bit and had to pop my head up and look for the buoy frequently. After rounding the 2nd buoy (we swam in a 1.5 km diamond shape), I found a hill I could use to keep an eye on to stay straight. I came up on the beach in about 41 minutes, pretty close to what I expected my time to be, with tons of energy left over. Wetsuit off, swim cap and goggles off, sunglasses on, helmet on, dry feet, cycling shoes on, grab bike and run awkwardly to the dismount line. 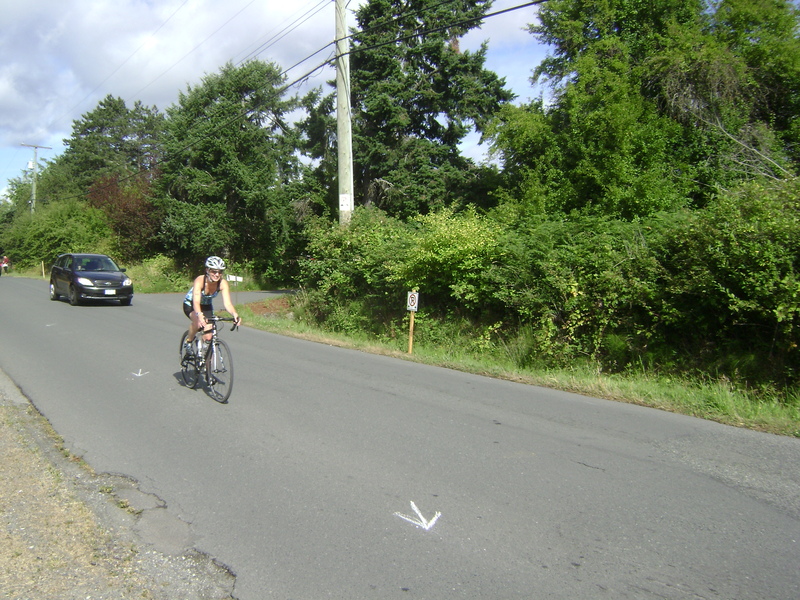 The 40 km bike route for this race followed West Saanich Road all the way out to the Victoria airport and back. It was undulating for the most part, with a few stand-up hilly sections and some nice flat sections through farmland. There was no drafting allowed in this race, which means you cannot ride right behind someone. We had to stay back at least 10 metres, and if we felt like we could pass, we had about 15 seconds to do so. I came up on a few people, and worked hard to pass within that time frame, but for the most part I was either riding alone or getting passed! My bike computer decided to stop working, so I had no idea how fast I was going. When I reached the airport turnaround, I figured I was about 45 minutes in, so it’d take me about an hour and a half to do the ride. My quads were burning a bit from the hill climbs, but I still felt good. I had two gels on the ride and was feeling ready for the run. Dismount bike before dismount line, run awkwardly to my transition area, rack my bike, helmet off, glasses off, race belt (with race bib attached) on, cycling shoes off, tri shoes on, grab another gel, Garmin on, hat on, stand there confused for two minutes trying to figure out where I should be exiting the transition area to start my run, ask someone where to go, thank them, start running. Familiar territory. My legs felt great and I quickly began to pass everyone who passed me on the bike. I was surprised I felt so good. I downed water at every station without stopping, and took another gel about 5 km into my run. I checked my Garmin — I was running sub 5-minute kms! After a 41 minute swim and a 1:30 bike! Being a runner at heart as its advantages in the tri, for sure. I crossed the finish line in 3:09, feeling like I could run another 10 km. I also came 5th in my age group, two spots away from a podium finish. Not bad for my first triathlon! So am I a convert now? Of course. 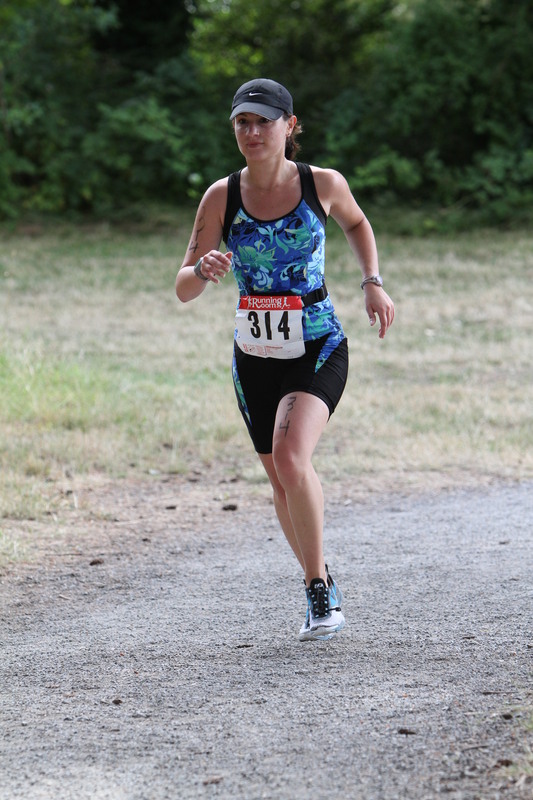 I can’t wait to do another tri (which happens to be next weekend… I signed up for the Subaru Sooke International Triathlon! But just the sprint distance this time). Besides, I have to answer that burning question all endurance athletes have: how much faster can I do it next time? Huge thanks to Noa of PT Performance Training for getting me ready and trained for my first triathlon — I would be clueless without your help! Also huge thanks to Krista for giving me that extra push I needed I commit to actually doing a triathlon and for all her help with the swim — from nose plugs and pool noodles to wetsuits and open water! My swimming has come a long way in nine months!